UConn’s Crystal Dangerfield (5) attempts a steal against Ohio State’s Adreana Miller (15) on Nov. 11 in Storrs. HARTFORD — No statistic can adequately define the leap Crystal Dangerfield has made since her freshman year. Neither can any singular shot, assist or steal — though, to be fair, there’s plenty that still register. As much as anything, her coach says, Dangerfield’s growth these past two years boils down to her willingness to stay on the floor. 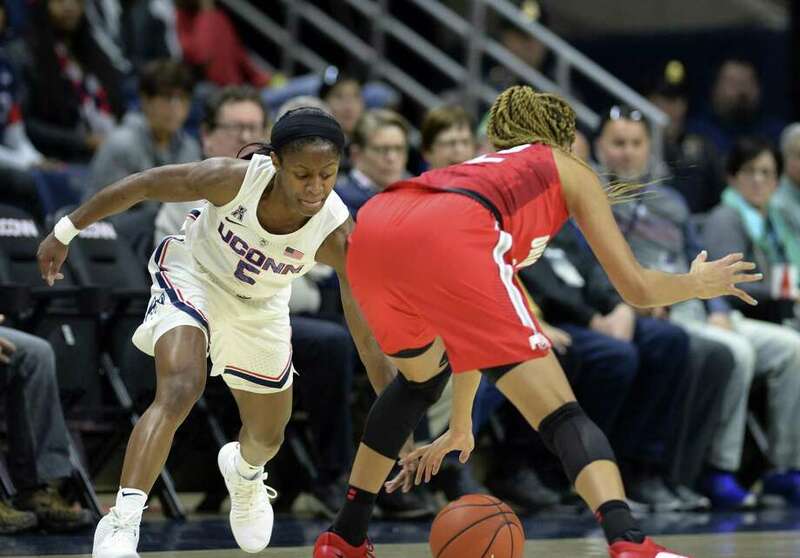 “She got knocked around pretty good today,” Geno Auriemma said of Dangerfield following UConn’s season-opening victory over Ohio State on Sunday. “She would’ve been out two weeks as a freshman. Anyone of those things happen, right to the training room. She would’ve been done. Dangerfield took a few shots, none more painful than an inadvertent bump to the eye that left her dizzy and unable to see for a few moments. All told, despite a few scares, she stayed on the floor longer than any other Husky — 31 minutes. If it were still freshman year, Dangerfield agrees, she wouldn’t have lasted four quarters. “For the next couple games, she probably would’ve been out of commission,” added forward Napheesa Collier, jokingly. Make no doubt about it, Dangerfield is older, wiser and, yes, tougher. Dangerfield carries herself differently this season because she must. She’s now an elder statesman in the locker room, one of the players whom Auriemma is counting on most to guide the Huskies to a 12th straight Final Four. The Huskies have their own Big Three, and it’s comprised of Collier, Dangerfield and Katie Lou Samuelson, a preseason AP All-American. The trio accounted for 54 of the Huskies’ 85 points against Ohio State. Dangerfield, a smooth, instinctual point guard, had 18 of those. For the most part, Ohio State couldn’t stop her. Next up on Saturday (6 p.m., Mohegan Sun Arena) is Vanderbilt, a program that is connected to Dangerfield in more ways than one. Dangerfield grew up in Murfreesboro, Tenn., the same town as Vanderbilt freshman forward Brinae Alexander. Dangerfield attended Blackman High and Alexander Riverdale High. CONGRATS, CHAMP: The night of Oct. 28, Dangerfield sent a congratulatory text to the most recognizable athlete to come out of her high school. That would be Red Sox pitcher David Price, who was instrumental in leading Boston to another World Series title. LET’S WAIT: Ossining High (N.Y.) guard Aubrey Griffin’s official signing has been pushed back to Tuesday due to the snow, her coach announced on Twitter. Griffin remains the Huskies’ lone commit for 2019.